Vinyl above ground swimming pool liners are measured by gauge or thickness. It's important to understand the kind of liner you need and want. So What's The Gauge Or Thickness? Glad you asked. A "Gauge" or "Mil." are both measurements of thickness. A liner that is 20Mil. will probably have a 20Mil. bottom and a 15Mil. side. A 20 gauge liner will usually have a 20Mil. bottom and a 20Mil. side. So as you can see the 20 gauge liner will probably be a little thicker. The most popular gauges for an above ground swimming pool liner are 20 and 25. The following chart can help. 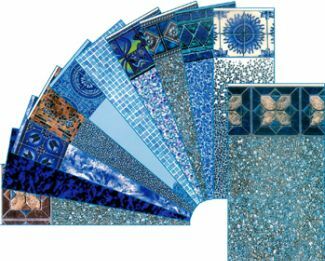 There are literally hundreds of patterns and styles from which to choose. This is not a complete list, but will give you an idea of what's available. Can I Get Any Style Of Above Ground Swimming Pool Liners I Want? Good question. The answer is "kinda yes". There are many different styles. It's not like back in the day when you're relegated to a solid blue color. You can always ask the company if they will install the liner for you. They all want your business, but you need to remember the correct size and shape of your pool to get the right fit. 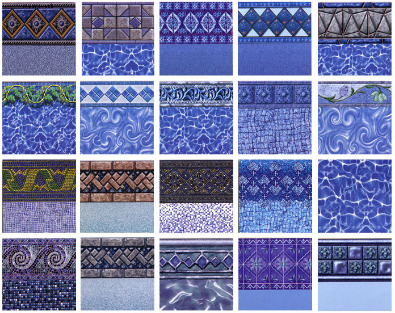 Talk to your local pool supply company, or simply go online and look at the many different styles and colors. What's the price? Is that the best you can do? There are others out there I like, you know? What's the maintenance? What do I need and why? Will you take care of that or do I? What's the warranty? What does it cover and not cover? I need to see specifics. Do you install it or do you have a sub-contractor? Is he licensed and insured? Is he experienced in these kinds of liners? I need to see proof. What are the safety features? What would happen if one of the safety features fail? If it does fail, who is responsible? If it fails, who will fix it? Will you fix it, or do you contract that out to someone else? Who is it? Why do you use them? How long have they worked with you? How about free delivery? I want that in writing. Are you part of the Better Business Bureau or the National Spa and Pool Institute? Have you had an excessive number of complaints? How long has your crew been working for you? How much experience do they having installing my kind of liner? If it rips, will you take care of the swimming pool liner repair? Do you have a high turn-over rate? If so, why and what specifically is the training? Do you offer financing? Is that the best rate you have? I bet I could get a better rate somewhere else. I think buying a brand spankin' new above ground swimming pool liner is like getting a new car. The smell and feel of that liner when it's being installed, filling up the pool, then jumping in and letting the smoothness glide under your feet.